We’d love your help. Let us know what’s wrong with this preview of Montauk by Nicola Harrison. 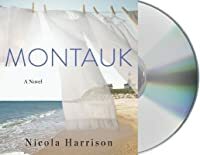 An epic and cinematic novel by debut author Nicola Harrison, Montauk captures the glamour and extravagance of a summer by the sea with the story of a woman torn between the life she chose and the life she desires. For three months, this humble fishing village will serve as the playground for New York City’s wealthy elite. Beatrice Bordeaux was looking forward to a summer of reigniting the passion between her and her husband, Harry. Instead, tasked with furthering his investment interest in Montauk as a resort destination, she learns she’ll be spending twelve weeks sequestered with the high society wives at The Montauk Manor—a two-hundred room seaside hotel—while Harry pursues other interests in the city. College educated, but raised a modest country girl in Pennsylvania, Bea has never felt fully comfortable among these privileged women, whose days are devoted not to their children but to leisure activities and charities that seemingly benefit no one but themselves. She longs to be a mother herself, as well as a loving wife, but after five years of marriage she remains childless while Harry is increasingly remote and distracted. Despite lavish parties at the Manor and the Yacht Club, Bea is lost and lonely and befriends the manor’s laundress whose work ethic and family life stir memories of who she once was. As she drifts further from the society women and their preoccupations and closer toward Montauk’s natural beauty and community spirit, Bea finds herself drawn to a man nothing like her husband –stoic, plain spoken and enigmatic. Inspiring a strength and courage she had almost forgotten, his presence forces her to face a haunting tragedy of her past and question her future. To ask other readers questions about Montauk, please sign up. I had to scroll down thru so many shills, it was shocking. Did anyone actually read this POS? Montauk is a historical novel about one woman’s path to self-discovery through an unexpected romance. Beatrice, a young housewife, summers in Montauk amongst the wealthy and privileged crowd, but yearns for more. She has lived a sheltered life, to say the least. Away from the bustle of New York City, she begins to recognize the cracks in her marriage. Struggling to fit in with the cutthroat society women, she befriends a laundress who introduces her to another kind of life, one filled with simplicity but built around love. When she meets a lighthouse keeper named Thomas, her life is altered forever. She finds herself being forced to choose between luxury and true love. Told through Beatrice’s eyes, Montauk is a slower-paced character study. While the reader gets an honest but, sometimes, frustrating view on Beatrice's life and the choices she makes, for me, it was too much telling and not enough seeing. I both enjoyed and struggled a bit with Montauk. I loved the setting, but I had trouble connecting with Beatrice, which was partially due to the narrative style. The transitions between narrative and dialogue were sometimes a little stiff and at other times rushed. The novel did feel authentic and while Beatrice is a product of her time, there were some moments when I just couldn’t read any more about her lack of awareness when it came to certain situations. On the other hand, Beatrice is a very likable character. I couldn’t stop myself from rooting for her. I found it much more interesting towards the end and was even a little surprised by how it ended. Montauk is in no way a bad read. I think this is one of those cases of it’s me, not the book! I received an ARC of this book through a Goodreads giveaway! Nicola Harrison's debut takes place in 1938, a turbulent time in history, where dark clouds hint of a world war to come, she explores the stifling expectations and roles of women at the time and a story that is revealing of the class inequalities of the period, the differences in the vacuous inconsequential lives of the rich and the more precarious lives of those that are poor, or making more modest livings. It is set in the spectacular natural beauty of the small fishing village of Montauk, Lon Nicola Harrison's debut takes place in 1938, a turbulent time in history, where dark clouds hint of a world war to come, she explores the stifling expectations and roles of women at the time and a story that is revealing of the class inequalities of the period, the differences in the vacuous inconsequential lives of the rich and the more precarious lives of those that are poor, or making more modest livings. It is set in the spectacular natural beauty of the small fishing village of Montauk, Long Island, known for its hurricanes, where for 3 months has the wealthy elite of New York City descend on it. Hoping to rekindle her marriage to Harry, Beatrice Bordeaux is staying amongst the high society wives at The Montauk Manor, a coastal hotel. Beatrice has been desperate for a child in her 5 year marriage, but there has been an increasing distance between the couple. Harry, however, has other plans, he is spending most of his time back in New York. Beatrice has little in common with the high society women, and they do little to welcome her. Beneath the glamour and fashion, these ghastly rich wives may have children, but have little to do with their care, they are marked by their dissatisfaction, rivalries, bigotry, the propensity to judge, are small minded, gossipy and with an overwhelming arrogance and air of superiority when it comes to the locals. Beatrice feels a sense of dislocation and finds these women of little interest, instead begins to connect with some of the locals, such as Elizabeth, the hotel's laundress, who reminds her of her more modest past life and the person she used to be and Thomas, the lighthouse keeper, the polar opposite of Harry as a man, and to whom she feels drawn. Unsavoury aspects of Harry's life spill out, leaving Beatrice stranded amidst the wreckage of her marriage, a consequence of the life she has chosen, and hopes for a life that is more true to who she is. Nicola Harrison presents her debut novel, Montauk, nestled on the tip of Long Island. It's the summer of 1938 and we, as readers, step into a time period wrapped in social mores, societal webbings, and male/female designated roles. Not one to be enamored with romance novels, this was a bit of a challenge for me, but through no fault of the writing skills of Nicola Harrison. She sets the tone precisely for the era and her complicated characters reflect that. My backbone arched a bit every time th Nicola Harrison presents her debut novel, Montauk, nestled on the tip of Long Island. It's the summer of 1938 and we, as readers, step into a time period wrapped in social mores, societal webbings, and male/female designated roles. Not one to be enamored with romance novels, this was a bit of a challenge for me, but through no fault of the writing skills of Nicola Harrison. She sets the tone precisely for the era and her complicated characters reflect that. My backbone arched a bit every time these individuals' actions demonstrated such tunnel vision in their societal roles. Yes, they were dancing fitfully to the beat of the music played on their dance cards. Right as rain. But I wished for thunderstorms in Montauk. Our main character, Beatrice Bordeaux, has been landlocked on Long Island for the entire summer by her aloof husband, Harry, who has taken up quite the extracurricular activities in New York City. He peppers his trail with lie upon lie and as women it was to be taken with a grain of salt. (Oh, sorry about that!) Beatrice longs for a baby and sits within the ruination of her marriage. Let them see you smile, Sister. My suggestion would be to take this one out for a spin and see what you think. Romance lovers will be enthralled as other reviewers gifted it with 5 Stars. It may ring the bell for your own sensibilities, but it left mine straining to hear more. We'll just have to see if Nicola Harrison continues in this particular genre or sets sail in a different direction next time around. I received a copy of Montauk through NetGalley for an honest review. My thanks to St. Martin's Press and to Nicola Harrison for the opportunity. A masterpiece! A book of sheer beauty and delight. Extremely visual and mesmerizing. This is a book to sit down and get lost in. A book written so beautifully that I felt like I was there in Montauk. This book deserves and award. The raw emotion and sheer beauty of how this book was written is something that should be loved, cherished and breathed in. Horray for Montauk!! Thank you NetGalley for my free e-copy of Montauk by Nicola Harrison! Beatrice Bordeaux, born lower/middle class, was college educated and married to wealthy Harry Bordeaux. Her story takes place the summer of 1938, in the fishing village of Montauk, the latest vacation hotspot for the wealthy. Beatrice and Harry's marriage is failing, not helped by the fact that Beatrice has still not gotten pregnant after five years of marriage. Thinking this summer vacation will be a new beginning for the two of them, Beatrice is dismayed to find that her husband plans to spen Beatrice Bordeaux, born lower/middle class, was college educated and married to wealthy Harry Bordeaux. Her story takes place the summer of 1938, in the fishing village of Montauk, the latest vacation hotspot for the wealthy. Beatrice and Harry's marriage is failing, not helped by the fact that Beatrice has still not gotten pregnant after five years of marriage. Thinking this summer vacation will be a new beginning for the two of them, Beatrice is dismayed to find that her husband plans to spend almost the entire summer back in the city, working, drinking, even conducting numerous affairs with other women, while Beatrice must pretend all is well with their marriage. Beatrice is bored, unhappy, and has nothing in common with the rich, snobby, summering wives, most who have children, nannies, and want more and more despite all their wealth. Naive Beatrice inserts herself into the lives of the poor, struggling service workers of the village, not realizing that her interference can endanger their jobs, the only thing that brings food on their tables. She even finds herself up on the hill of the lighthouse and ends up very involved in the life of Thomas, the lighthouse keeper. Beatrice has to face what she wants from her life, as the summer draws to a close. Thanks to Netgalley for an arc in exchange for an honest review. Montauk 1938: This was a bit of a slow burn read about a young wife, Beatrice, childless after 5 years of marriage and taking a break from New York City to summer in Montauk. While her distracted husband, Harry, is busy with his investment career in the city, Beatrice begins to wonder what type of future she can expect. Bored with the trivial pursuits of the other summer people, Beatrice finds herself becoming more and m Thanks to Netgalley for an arc in exchange for an honest review. Montauk 1938: This was a bit of a slow burn read about a young wife, Beatrice, childless after 5 years of marriage and taking a break from New York City to summer in Montauk. While her distracted husband, Harry, is busy with his investment career in the city, Beatrice begins to wonder what type of future she can expect. Bored with the trivial pursuits of the other summer people, Beatrice finds herself becoming more and more interested in the lives of Montauk's locals. When a journalist approaches Beatrice to consider writing a column about the comings and goings of the high society, she embarks on a journey that just might rock more than the magazine's readership. Despite the fact that I knew exactly which road this story was going to eventually lead the main character, I did feel that Nicola Harrison managed to recreate late 1930's America and all the prejudices that existed between people of different social classes. Beatrice's plight that she will never measure up to the other women of her class, the anti-Semitism targeted at a character, the fear of another world war looming, and the lack of freedom that women held in their marriage all created an engaging plot. I did have to remind myself that Beatrice was a woman who as Nicola Harrison relates in her back story was a woman of her time. So sometimes when she acted with naivete, I had to push down my 21st century impatience. Thank goodness for characters like Elizabeth and Dolly that played the role of reasoning. I would be very interested in reading more of this author in the future. Nicola Harrison delivers a beautifully enriched historical fiction novel with aspects of romance. The story takes place in 1938 on a beautiful island and we all step into a time period wrapped in male/female societal roles and norms. I am always hesitant to read historical novels because they're not me favorite genre but I was so impressed with Nicola Harrison's debut. She truly has a way with her words and writing style! I think alone I would read another book by her because I was truly so enamor Nicola Harrison delivers a beautifully enriched historical fiction novel with aspects of romance. I think alone I would read another book by her because I was truly so enamored with her writing!! I was fascinated with the characters and how much the societal norms were ingrained in so many individuals back then. I really liked the romance act to it as well..... if you're not a romance person than I may say this isn't for you? My only minor issue with this one was it was a tad long for me a very slow slow burn. I was loving her writing but wanted something to pick up in the beginning. Overall, this was an enjoyable and beautiful read. Thank you to Netgalley and St. Martin's Press for the arc in exchange for an honest review. Thought author, Nicola Harrison did a fine job (on her debut) of bringing the summer of 1938 MONTAUK Manor and the neighboring small village characters to life. The story of Beatrice, her humble beginnings, struggles with her sleaze of a husband and interaction with the obnoxious women of high society were interesting and at times even funny. Although slow going at first and mostly predictable (except ending) enjoyed mention of historic figures of the time and romantic interlude, but overall just an okay read (for me). This book is extremely well written, especially for a debut. The author takes us to a new vacation hotspot in 1938, Montauk, Long Island, where New York's wealthiest plan to invest and spend their summers from then on. Beatrice and her husband Harry hope to rekindle some of the spark in their marriage after failing to get pregnant. Instead a giant chasm is created when Beatrice discovers some things about Harry, and then about herself. She no longer feels she fits into such a life, be 3.5 stars. This book is extremely well written, especially for a debut. The author takes us to a new vacation hotspot in 1938, Montauk, Long Island, where New York's wealthiest plan to invest and spend their summers from then on. Beatrice and her husband Harry hope to rekindle some of the spark in their marriage after failing to get pregnant. Instead a giant chasm is created when Beatrice discovers some things about Harry, and then about herself. She no longer feels she fits into such a life, being from a simpler background and finding the other wives to be mostly shallow and self-centered. The seaside town of Montauk, originally a small fishing village with a lighthouse and mysterious lighthouse keeper, is described with visuals that had me picturing every scene. I was rooting for Beatrice to come into herself, even though there was more romance here than I usually get into. I loved Dolly, one of the more likeable wives, and Elizabeth from the village, both of them straight shooters in contrast to Beatrice. The ending had me reeling -- I will say it was unexpected and even over the top. Could have turned out much differently. This will be a bestseller. St. Martin's Press states a release date for June 4, 2019 and may advertise it as a perfect beach read. This fish out of water story is sure to be embraced by those, who enjoy tales of forbidden love. I enjoyed that the story mainly because it has a character driven plot. The key characters had depth and they reactions to each other at times seemed out of character and yet, the gossip, backbiting and sabotage would probably make most people react at some point in like This will be a bestseller. St. Martin's Press states a release date for June 4, 2019 and may advertise it as a perfect beach read. This fish out of water story is sure to be embraced by those, who enjoy tales of forbidden love. I enjoyed that the story mainly because it has a character driven plot. The key characters had depth and they reactions to each other at times seemed out of character and yet, the gossip, backbiting and sabotage would probably make most people react at some point in like manner - these moments had me smiling and once even laughing out loud. Likewise, her ability to describe Montauk's beauty in it's near pristine state back 1938 was vivid. I really appreciate how the author portrays the upper class constant pursuit of wanting more... as well as their insensitivity to those without wealth. Beatrice, the lead female character is greatly distressed by what she observes and seeks to have a positive impact. Ms. Harrison writing is captivating and she should be pleased with her debut! Her ability to describe the beauty of Montauk in 1938 was vivid. It's downfall for me was the foreshadowing was a bit to obvious for me - however, it was still interesting to me. There were some details that were not accurate (which hopefully will be revised or remedied before the 2019 Public release), that would push it to 4 or 5 star for me. However, if you read the publisher's blurb, you have a decent insight about the story going in. I had a little difficulty at the beginning, however, it became more intriguing as it went forward. This type of book, romance, extra-marital affairs, love stories, especially amongst the rich and frivolous are not a genre I would normally read. To be fair, I have to separate my preferences and rate the book for its vivid portrayal of its characters, its terrific sense of place and time, the visual descriptions of the luxurious resort, the glamorous attire and gourmet dining, with its dramatic, heartfelt conclusion. Highly recommended for those who enjoy romantic historical writing with some This type of book, romance, extra-marital affairs, love stories, especially amongst the rich and frivolous are not a genre I would normally read. To be fair, I have to separate my preferences and rate the book for its vivid portrayal of its characters, its terrific sense of place and time, the visual descriptions of the luxurious resort, the glamorous attire and gourmet dining, with its dramatic, heartfelt conclusion. Highly recommended for those who enjoy romantic historical writing with some sadness and strong character growth. This was such a lovely debut novel! Set in 1938 in Montauk, it revolves around Beatrice and her overbearing husband, Harry. As they've come to "summer" there at a lovely resort, Beatrice looks forward to spending lazy days and lavish party-filled nights with her husband. But he's only there for weekends as he must work in the city to support them. What Beatrice discovers is that her wealthy "friends" are not all they appear to be; instead they are petty, jealous, mean-spirited, and judgmental of This was such a lovely debut novel! Set in 1938 in Montauk, it revolves around Beatrice and her overbearing husband, Harry. As they've come to "summer" there at a lovely resort, Beatrice looks forward to spending lazy days and lavish party-filled nights with her husband. But he's only there for weekends as he must work in the city to support them. What Beatrice discovers is that her wealthy "friends" are not all they appear to be; instead they are petty, jealous, mean-spirited, and judgmental of the locals who work for them. Beatrice discovers a whole new world when she meets the somewhat-eccentric lighthouse keeper in the fishing village and this opens her eyes to a world she never knew existed. I loved everything about this book: the time period where women were supposed to be "obedient," the catty chatter of women believing themselves to be superior, the lovely setting of the village and its people, and especially the character of Beatrice who proves that women are a force to be reckoned with! The novel is heartbreaking and heartwarming, both lyrical and realistic. It is a book to be savored. First, I'm not a romance lover; I seldom read them anymore. I did read dozens and dozens when younger, though, ate them up like you would hot dogs at a hot-dog-eating-contest. Could not get enough of them. So I know, understand and do appreciate the genre, even though I no longer eat hot dogs. And two, I didn't read the entire book. Not my fault. My mind wandered. I was angry at the MC. Then I didn't care about her. Or her friends. Or the men in her life. Or anyone for that matter. This is a superficial-light read IMO. I do have a lot of fav. romance and romance-inside-a-mystery type books. I like deep layers. I like surprises. I like sudden shifts of characters in which you think: omg, yes! He really is like that and why didn't I see it? Or oh no! Now I understand why she did that then, or said that when. This book is froth and bubbles - a bubble bath with only bubbles. No warm, comforting water beneath - or startling chilly ice. No scent, no aroma, no depth. Because if romances are a bubble bath I like mine in a tub ten feet deep. What's under there? That's half the fun of reading them. So in this one a poor little middle-class kind of girl marries a rich narcissistic egotist who makes her go off for the summer to a rich player's playground. There she doesn't fit in, though tries mightily to do so, but alas, finds herself attracted to another and what to do? WHAT TO DO? Find a good book, curl up in a wicker chair on a sunny porch and read it. Just not this one. A life she chooses or a life her heart desires. Life is what you make of it but for Harry and Beatrice it's anything but loving. The turning point of the marriage was in bearing children as they had difficulty conceiving. As things moved along on Montauk Island in 1938 the plot thickens as Thomas enters the picture and readers are also introduced to Bea's brother Charlie who tragically passed. Without giving up to much of the plot this humble fishing village is quite the scene as things begin to hea A life she chooses or a life her heart desires. Without giving up to much of the plot this humble fishing village is quite the scene as things begin to heat up near the lighthouse. Raised to be a modest country girl Bea is not used to the wealthy elitist that now surround her who pretend giving to charity is actually a case of 'giving' and not 'attention seeking'. That need to simply belong, to bear a child, to be loved is consuming her whole. Bea wants out of the marriage and fast but there's a dark side to Harry that's scary to witness and harder to understand. Bea finds herself in a flight or fight response mode but also in a stage of seeking her true identity and becoming authentically real in her own skin. What I loved about this is the clarity, the suspense, the plain and simple dialogue that wasn't powdered with fillers. This had everything it needed to be the powerhouse it reads in print and I dare say I hope this goes to film. Her romance with Thomas who once saved her life and now was in the cross hairs was superb. Thomas seemed ordinary as a lighthouse keeper yet he was so much more to the one lady in which it mattered most. Her fate is in the hands of these two men and the ending was one of the most powerful I've read this year. Thank you Nicola, St. Martin's Press, Netgalley, and Aldiko for this ARC in exchange for this honest review. One of the problems with reading and reviewing an uncorrected bound manuscript is that the reader/reviewer has no idea what, if anything, will be corrected or altered prior to the actual publication of the work. It sort of makes the review rather nebulous since it may have little if anything to do with the book that goes out to the public. Still, having waded through this book, as superficial as the entitled rich folk who first and still populate Montauk, especially in summer, it seems something One of the problems with reading and reviewing an uncorrected bound manuscript is that the reader/reviewer has no idea what, if anything, will be corrected or altered prior to the actual publication of the work. It sort of makes the review rather nebulous since it may have little if anything to do with the book that goes out to the public. Still, having waded through this book, as superficial as the entitled rich folk who first and still populate Montauk, especially in summer, it seems something should be said. Time is summer 1938--a Depression year, though hardly mentioned in the narrative. Montauk is still primarily a fishing village on the very tip of Long Island, several hours distant by LIR from the hot, concrete canyons of Manhattan. One of the rich moguls from this segment of society is on the brink of going under since he developed Miami into the disaster it still is. A hurricane has cost him tons of money and now he needs investors to continue his destruction uh development, of another pristine Atlantic coastal town. A Manor has already been built and to it is brought the spoiled, overindulged wives of his possible saviors. They, their children is any and the requisite nannies, have been deposited safely out from underfoot by the men who return on week-ends to complete their obligations as loving spouses and fathers. Among these women is an innocent wife, not originally of this caste of American society, who finds herself out of sync and beyond her depth. She feels obligated to play her role as wife, which is to cozy up to the other wives in an effort to gain access to their husbands' influence in the success of hers. Of course, these cliques are well-established and not easily entered. But, loving her husband and believing herself to be loved in return, she does her best. All is not warm and cozy with the husband who prefers cards and hunting and drinking to her company but she's fine, sort of, with that, UNTIL the big reveal--he's unfaithful. As you can see, nothing, so far is unique or unusual about this plot. And so it continues, as she, as superficial and bored as the rest of the pampered city gals, finds herself insinuating herself into the family of the local laundress, who does the dirty wash for the rich. The book uses every possible way to drive home how little these people do for themselves and how bigoted they are, without really clarifying the lot of the locals who serve them and depend upon their financial contributions to the family income. Despite the pleadings of Elizabeth. the laundress, and the knowledge that her continued insistence on having a relationship with her might cause the loss of job and income, our heroine, Beatrice, persists and prevails. From this connection she finds herself involved with the lighthouse keeper and here, too, she, without consideration for his reputation or his job security, selfishly pursues a dangerous path. This liaison results in the expected calamity of true love, complications and seemingly unsolvable disaster. So, not knowing where to go with the situation she has created, the author creates a true natural disaster which ties everything up neatly for all concerned. The whole thing totally expected, none of which is particularly moving and all of which leaves the reader with the sense of having wasted an awful lot of time on a pedestrian soap opera of a plot. For a summer weekend at the beach, probably not too emotionally or intellectually demanding. Maybe that's okay but that is all it is--okay. Nicola Harrison’s debut novel is one not to be missed. Beatrice is stunned when her husband Harry , one of Manhattans elite , informs her that she and much of their social circle will be “ Summering “ in Montauk as the husbands remain in the city and travel out for weekends. Beatrice falls in love with the beauty of Montauk and its people, it’s real people not her Nicola Harrison’s debut novel is one not to be missed. Beatrice falls in love with the beauty of Montauk and its people, it’s real people not her social circle , with whom she is finally seeing them for who they are . I loved this book, the characters and the story! The author has done a great job with the characters, the time period and the beauty of her writing had me sunning myself and smelling the salt air ! I just don't know where to begin. I will say I loved reading this novel but I must add,,,not wanting to give out a spoiler,,,,I want to rewrite a part. That is why I gave this a four star instead of five. I am a complete romantic, I'll be the first to admit it, and that is why I am so upset after reading this. Don't get me wrong, it is a wonderful read, well written, characters are developed to a tee, the story line in great, and historical research is on target. Two wrongs don't make a right. I I just don't know where to begin. I will say I loved reading this novel but I must add,,,not wanting to give out a spoiler,,,,I want to rewrite a part. That is why I gave this a four star instead of five. Two wrongs don't make a right. I grew up learning that and often have heard myself telling my family/friends that very thing. BUT, in a romance/historical novel, just forget about the lessons in life and give me a completed feeling that goes along with my romantic soul. You will love Beatrice, our heroine in this story, and will find yourself cheering her on as she weaves herself through some difficult decisions to find security and happiness. I loved this story that took place in the late 1930's in Montauk. Bea and Harry her husband have goneto Montauk to help get their marriage on track.Harry has been having affairs with several women and is always busy with his business.Bea meets Thomas the lighthouse keeper and a romance developes between them.I hope to read more books written by Nicola Harrison.I won this book from a Goodreads giveaway. I won this book in a Goodreads giveaway. Historical fiction is my favorite, however, this book just didn't click for me. I didn't feel any connection to the characters and I felt like the end of the book seemed rushed to me. Overall I was disappointed. American author F. Scott Fitzgerald gave us a cast of characters living in the fictional towns of West Egg and East Egg on prosperous Long Island in the summer of 1922. The Great Gatsby, acclaimed by many as “The Great American Novel” still resonates with its themes of decadence, idealism, resistance to change, social upheaval, and excess, creating a portrait of the American Dream, circa the Roaring Twenties. Debut author Nicola Harrison presents a fresh version of these themes and high society American author F. Scott Fitzgerald gave us a cast of characters living in the fictional towns of West Egg and East Egg on prosperous Long Island in the summer of 1922. The Great Gatsby, acclaimed by many as “The Great American Novel” still resonates with its themes of decadence, idealism, resistance to change, social upheaval, and excess, creating a portrait of the American Dream, circa the Roaring Twenties. Debut author Nicola Harrison presents a fresh version of these themes and high society life on Long Island. The year is 1938 and the town is Montauk, a sleeping fishing town awakening to its potential as a playground for the wealthy. Life after the 1920’s was hard because of the Depression, but the socialites of 1938 are feeling optimistic as they begin their summer season at a new hotel. Like many other couples, Beatrice has come with her husband of five years, Harry Bordeaux, from Manhattan to Montauk. He assures her that this will be a time for them to reconnect. But Harry, like the other husbands, leaves his wife and takes the train back Manhattan. The men will return to play in Montauk every weekend. During the week, Beatrice must make her own way in the hierarchy of women- dealing with committees, teas, galas, tennis lessons and cocktails on the beach. She makes friends with the modern and level-headed Dolly. Beatrice wants to be a good and loyal wife and support her husband, but the empty society life makes her feel detached and restless. She is drawn to the more down-to-earth working class townspeople, yet she doesn’t fit in with that world either. As she and Harry continue to drift apart she learns about the unsavory side of him. For Beatrice the striving world of Manhattan, with its greed, and social climbing, its teaming crowded streets, contrasts with the natural beauty and freshness of Montauk and the simple qualities and strength of the townspeople. Have visited the area in the 80's to see a lyme disease doctor so didn't spend a lot of time there but holds special memories for us. Book starts out with driving the roads along the water edge, many of the cottages are magnificant. The couple has had other friends who've stayed in the area in the summer and the inn has lots of events planned. Beatrice and Harry had planned this trip for a while. He is a Bordeaux and he has to provide for her. He will work and live in the city and come down on weekends to spend with her. Sounds like a fun outdoorsy place, just what we'd be looking for...they are bypassing Providence and Newport-places we live very close to to stay at Montauk. Knowing the date I had not expected what happens next but won't spoil it for others-we also experienced it in RI-up the coast from this location-out of the blue, so devastating. She has plans for her life but this event may have changed her mind. Lot of characters but easy to keep track of them all and there's a lot of drama from all angles. Enjoyed the read and especially the location and hearing of the locals and their life. Received this review copy from a publicist via St. Martin's Press from NetGalley and this is my honest opinion. I quite enjoyed this story. Beatrice thinks she knows how her life will be until her summer in Montauk. At times I thought the story would be predictable but then I was proved wrong. Very good book. Montauk, Long Island in the year 1938 is where anyone who is anyone will be summering. Away from the heat of the city. Fresh ocean breezes and a small fishing village and even a lighthouse. Beatrice Bordeaux is a young woman from the countryside of Pennsylvania. Swept off of her feet by the charming Harry, they have been married five years and yet still have no children. The elite of society corral their nannies and children and head to the Manor for the summer. Beatrice thinks she may like being Montauk, Long Island in the year 1938 is where anyone who is anyone will be summering. Away from the heat of the city. Fresh ocean breezes and a small fishing village and even a lighthouse. The elite of society corral their nannies and children and head to the Manor for the summer. Beatrice thinks she may like being by the ocean all summer until her charming husband tells her he isn't staying. He will be coming on the week ends, which gradually just stop after she catches him cheating. While it looks as though the Junior League has just moved locations, with meetings and fund-raisers and a whole lot of back stabbing, cheating, drinking and behaving badly. Bea befriends Elizabeth, who lives in town and does laundry for the Manor. And through Elizabeth she meets a man unlike any she has ever met and before long things are getting pretty serious. Beatrice is noticing the behavior of the city dwellers with their noses in the air and is not happy with it. As her love for her lighthouse keeper grows so does her guilt. But I did not expect that ending! I did get upset with Beatrice a few times. But then I thought, it is 1938, and divorce wasn't looked on as well as just putting on a brave face and having affairs of one's own. At the beginning her timidness irritated me. Until she found a way to address the situation in Montauk and what was really going on there. At the end she was a strong and independent woman. I typically don't read historical fiction, but I grew up on eastern Long Island and have spent quite a bit of time in Montauk. So how could I possibly refuse the opportunity to see what Montauk was like in 1938(I couldn't)? It was the beginning of the end of a quiet fishing town when wealthy NYC residents began arriving in droves for the summer. Beatrice and Harry have been married for 5 years and have grown apart. The thought of spending the summer away from the city, gives Beatrice hope that s I typically don't read historical fiction, but I grew up on eastern Long Island and have spent quite a bit of time in Montauk. So how could I possibly refuse the opportunity to see what Montauk was like in 1938(I couldn't)? It was the beginning of the end of a quiet fishing town when wealthy NYC residents began arriving in droves for the summer. Beatrice and Harry have been married for 5 years and have grown apart. The thought of spending the summer away from the city, gives Beatrice hope that she and Harry can reconnect. What she hadn't fully considered were the long lonely weekdays when Harry went back to work and she was left to make friends with the other wives. Many of these women are already mothers and Beatrice has very little in common with these society wives. Beatrice grew up in rural Pennsylvania far from the glitz and glamour of NYC and is more comfortable with those who work at the Manor. Will this summer in Montauk be good for Beatrice and Harry or will it tear them apart? The author did a wonderful job describing not only Montauk but also what it was like to summer with high society. So many rules, so much extravagance, and so little actual love between so many of these characters. No spoilers here, but I will say I was hoping that Beatrice would find some way to belong. The pace is slow, like a lazy summer day, but not at all boring. It is a look at a simpler time and place and the fact that I read this in front of a fire on a cold fall day, made me long for summer in Montauk. I have read so many wonderful debut novels in 2018 and Montauk is another one to add to that list. Many thanks to NetGallery, the publisher and author, Nicola Harrison, for the opportunity to read and give a honest review of "Montauk." A book about getting away from the city and vacationing at a lavish resort, Montauk Resort, Long Island. Looking into how the wealthy class spends their summer and what can happen when unpredictable truths come to light. 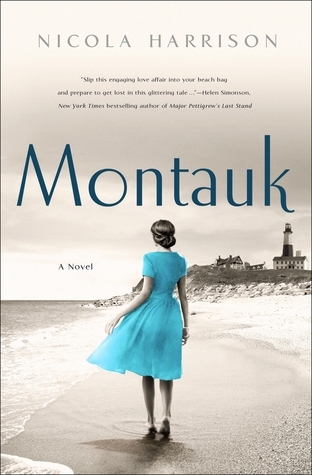 Main characters are Beatrice and her husband, Henry along with Elizabeth, the lady that does the laundry at the Resort and Thomas, the lighthous Many thanks to NetGallery, the publisher and author, Nicola Harrison, for the opportunity to read and give a honest review of "Montauk." Main characters are Beatrice and her husband, Henry along with Elizabeth, the lady that does the laundry at the Resort and Thomas, the lighthouse keeper. I felt it started out pretty slow and I was losing interest but, the story picked up about half way in and caught my interest again. It was interesting to read about the parties, dress codes and what was deemed socially acceptable. This book is described as a "beach read," and it definitely is that. It is an engaging easy to read romance novel. The author does a great job of giving the reader a good sense of time and place, with her descriptions of the location (an exclusive hotel in Montauk), the fashion (think the Great Gatsby), and tidbits of current events from 1938 (just enough to give the reader a feel for what was going on in the world at the time). The characters, particularly the main characters, are well develope This book is described as a "beach read," and it definitely is that. It is an engaging easy to read romance novel. The author does a great job of giving the reader a good sense of time and place, with her descriptions of the location (an exclusive hotel in Montauk), the fashion (think the Great Gatsby), and tidbits of current events from 1938 (just enough to give the reader a feel for what was going on in the world at the time). The characters, particularly the main characters, are well developed, and you can feel the emotional struggles of Bea (the main character), who, as a fish out of water, feels more comfortable with the local villagers than she does with the high society women in the hotel. Though it was easy to read, I found it just a tad too long (maybe 50 pages) while, at the same time, the end felt rushed, with everything happening at a much faster pace than things happened in the rest of the novel. Despite these criticisms, I found the book to be an enjoyable read and look forward to more books by Ms. Harrison. I've been in a little reading slump. I started reading this story of the elite New York City citizens summering in Montauk in 1938 and was hooked. I didn’t want to put down this tale of Bea Bordeaux who is staying at Montauk Manor for the summer. She is a bit of a fish out of water, hoping to rekindle her relationship with her husband, assisting him with his business ventures by befriending the “right” people. Bea finds herself drawn to the locals who support the resort and questioning the moral I've been in a little reading slump. I started reading this story of the elite New York City citizens summering in Montauk in 1938 and was hooked. I didn’t want to put down this tale of Bea Bordeaux who is staying at Montauk Manor for the summer. She is a bit of a fish out of water, hoping to rekindle her relationship with her husband, assisting him with his business ventures by befriending the “right” people. Bea finds herself drawn to the locals who support the resort and questioning the morals of the high society she has married into. If I could give 4.5 stars I would. I gave the full five because the descriptions of high society summer living were so interesting as was the historical setting. I hated to stop reading it to do chores. It will be an awesome summer vacation read. I can’t wait for my friends to read it. Thanks to NetGalley for letting me read an ARC.